Watch and read a few user experiences of Skilloon below. At the English School in Helsinki, Skilloon was tested in January 2018. The experiences have been good. The compulsory course OP2 for high-school students includes a two day long “job shadowing” period both during the first and second year of studies. This year a course named “Get Ready for Work” on Skilloon was given as an alternative for completing these two “job shadowing” days, in which students completed exercises related to working life skills and entrepreneurship. Students participated with excitement in this opportunity. From the perspective of a student counsellor, creating the course was easy, and the program itself was very easy to use. In the High-School of Lieto, Skilloon was taken as a tool for student counselling during the graduating seniors’ last study module. Graduating senior Riku Vidqvist reflected, that the exercises encouraged to stop and gave new points of view in preparing for the matriculation examination. “I had to really think and work hard” –Vidqvist commented. The principal of High School of Lieto, Jyrki Saarnia, thanked Skilloon for being in line with the needs and atmosphere of the present day. According to the new curriculum, the school must be constantly evaluated, and the statistics in Skilloon provide an excellent tool for this. Finland is a leading country in education. Finland has attained top scores in the PISA test, and it is the happiest country in the world according to the World Happiness Report 2018. Finnish education focuses on high-quality education and life-long learning. Read more about Finnish education. The duration of compulsory education in Finland is 10 years. Read more about education in Finland, and how it is special. SKILLOON is a research-based learning environment that puts entrepreneurial learning into practice. 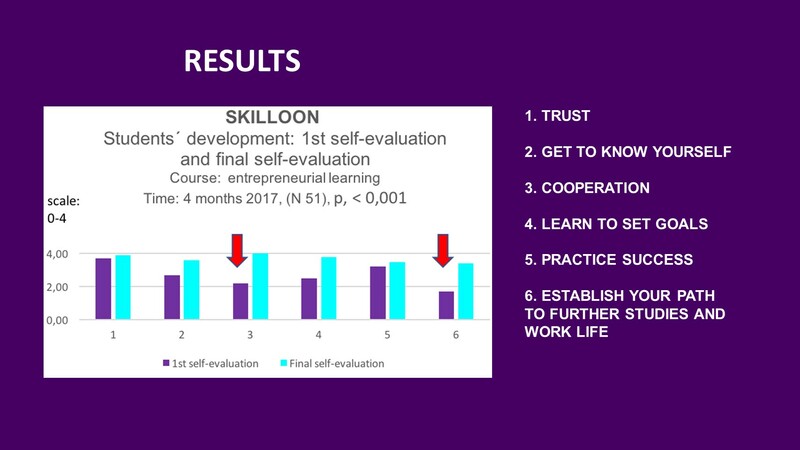 In the three videos below, adjunct prof. Jaana Seikkula-Leino explains the benefits of SKILLOON, and the research behind it. What is SKILLOON and what are its benefits to the user? What is SKILLOON based on research-wise? How is assessment implemented in a reliable way in SKILLOON? Get a better understanding of SKILLOON through this brief brochure. Read more about SKILLOON and the idea-courses in this brochure. Skilloon has been developed in cooperation with several Finnish schools, universities and research groups, and involves a high degree of international cooperation. Skilloon has given good results and helped students in self-development.